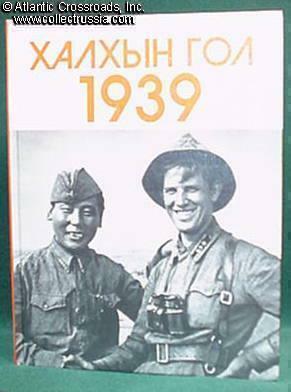 $45.00 "Khalkhin Gol, 1939" by Uslyn Publishing House, Ulaan Baatar, 1989. Excellent photo documentary on the brutal clashes which stopped the Japanese westward expansion and heralded the Pacific campaigns of WW2. Out of print. Mongolian text. A superb unused copy in mint condition. $49.00 "Great Patriotic, 1941-1945". Excellent photographic. Preface by Marshal Chuikov. Hundreds of photos. Russian text. $95.00 "History of Russian Aviation in Photographs" Russian and English text. 373 pages, big hardcover with stunning, high resolution photos on every page. $35.00 Time Life's "The Soviet Juggernaut", excellent basic photo documentary. English language. $20.00 "Parades of Steel and Motors". M Baryatinskiy	Subtitled "Soviet and Combat Equipment, 1918 - 1995". 96 pp, over 200 photos. Russian with English photo captions. $25.00 "Soviet Women Snipers of the Second World War", Y. Obraztsov and M. Anders; C 2014, Paris, France. English text trade paperback, 110 pp, illustrated throughout in b/w and color. A very nice in-depth publication on Soviet female combatants in unprecedented role. $30.00 "S. M. Budyonny", Photo-biography of one of the most prominent Bolshevik military leaders of the Russian Civil War, creator of the First Cavalry Army. Russian text. $50.00 "M. V. Frunze" 1990, Hard cover with dust jacket, 9" by 12", 192 pages; excellent condition. Out of print. A photo album and biography of an early Bolshevik leader-- one of the most famous Red commanders of the Civil War. Russian text. $65.00 "A. M. Vasilevsky", illustrated biography, published in the Soviet Union in 1991. Russian text. Hard covered with dust jacket, large 9" by 12" volume, 200 pages. Aleksandr Vasilevsky was one of the most prominent Soviet military leaders. $45.00 "Cavaliers of the Gold Stars"	Nikolay Babaev, Yuriy Ustinov. C. 2001, Moscow. Russian text, hard cover with d/j, 470 pp, hundreds of b/w photos. This book contains biographies of all twenty-three recipients of 3 or more Hero Stars (HSU and/or HSL). $24.00 "Land Forces of RKKA. On the Distant Approaches to Moscow: Vyazma - Bryansk Strategic Defense	Operation, 30 September - 30 October 1941". In Russian with English captions. I. Moschansky, E. Kharitonova. C. 2003, 72 pp, over 120 b/w photos, 3 tactical maps and a number of superb color plates. $29.00 "The Battle for Rostov, 29 September - 2 December 1941", Yuriy Krasnykh & Ilya Moshchanskiy, Moscow, 2007, In Russian with English captions, Soft bound, 68 pp, 100 b/w photos, 6 color illustrations, 5 color photos, 2 maps. Single copy in stock showing minor shelf wear to the cover. $22.00 "Blocade of Leningrad. Counteroffensive at Tikhvin, 10 November - 30 December 1941" Il'ya Moschanskiy, Dmitry Sakhonchik C. 2004 Moscow. In Russian with English captions. Soft cover, 68 pp, 140 b/w photos. $22.00 "Battle for Crimea, September 1941 - July 1942" I. Moschanskiy, A. Savin C. 2002, Moscow. Russian with English captions. Many photos and some color profiles. $22.00 "1941: Battles in Belorussia" Aleksandr Smirnov, Aleksandr Surikov. In Russian with English captions. Soft cover, 79 pp, dozens of b/w pictures. $22.00 "1941: Battles in the Ukraine" Aleksey Isaev. In Russian, Moscow, 2004. Soft cover, 79 pp, dozens of b/w pictures, 5 tactical maps, color illustrations of Soviet and German tanks. $22.00 "Battle for Moscow, 30 September - 5 December 1941" Maksim Kolomiets. Russian with English captions, 2002. Soft cover, 79 pp, 100 b/w pictures, 4 tactical maps and 6 color illustrations. $22.00 "1941: Battles in the Baltic, 22 June - 10 July 1941" Maksim Kolomiets. In Russian with English captions, Moscow, 2002. Soft cover, 79 pp, dozens of b/w pictures, 6 tactical maps (two of them in color), color illustrations of armor and German tactical markings. $22.00 "Battles in the Don Bend, 28 June - 23 July 1942" Maksim Kolomiets, Aleksandr Smirnov. In Russian with English captions, Moscow, 2003. Soft cover, 79 pp, many b/w pictures plus color profiles. $19.00 "Defense of Caucasus, July - December 1942" M. Kolomiets, I. Moschanskiy. In Russian with English captions, 79 pp, 100 b/w pictures, 2 tactical maps and 12 color illustrations of Soviet and German vehicles. $23.00 "Operation Citadel (Kursk Strategic Defense Operation). Battles on the North Flank, 5-12 July" T. Abashidze, I. Moschanskiy. In Russian with English captions, 71 pp, 146 b/w pictures, 3 tactical maps and 6 color illustrations. $22.00 "Liberation of Austria. Vienna Offensive, 16 March - 15 April 1945". Russian with English captions, Moscow, 2003. Soft cover, 72 pp, over 130 of b/w pictures, tactical map in color and 9 color illustrations. $24.00 "On the Yugoslav Soil, Belgrade Strategic Offensive, 28 September - 20 October 1944". In Russian with English captions, Moscow, C. 2005.